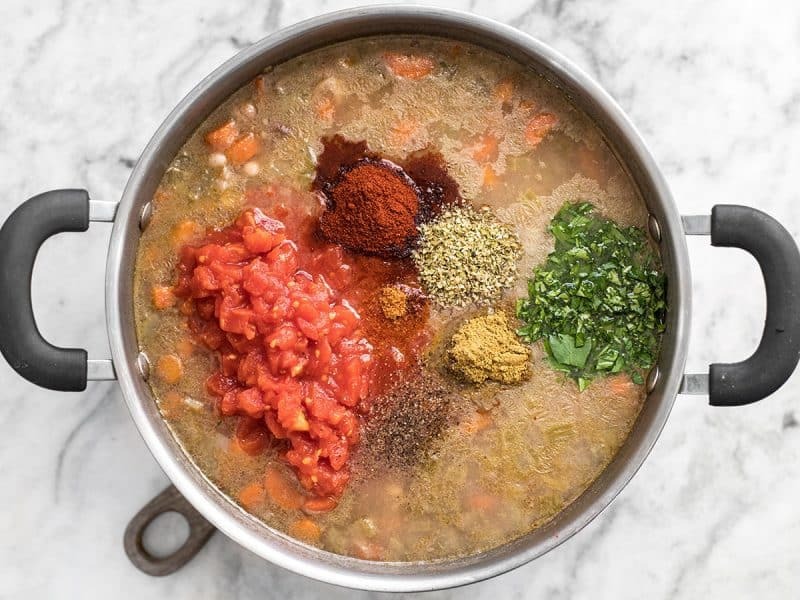 THIS is one of those soups that makes you feel good about your health and is still incredibly delicious and satisfying. 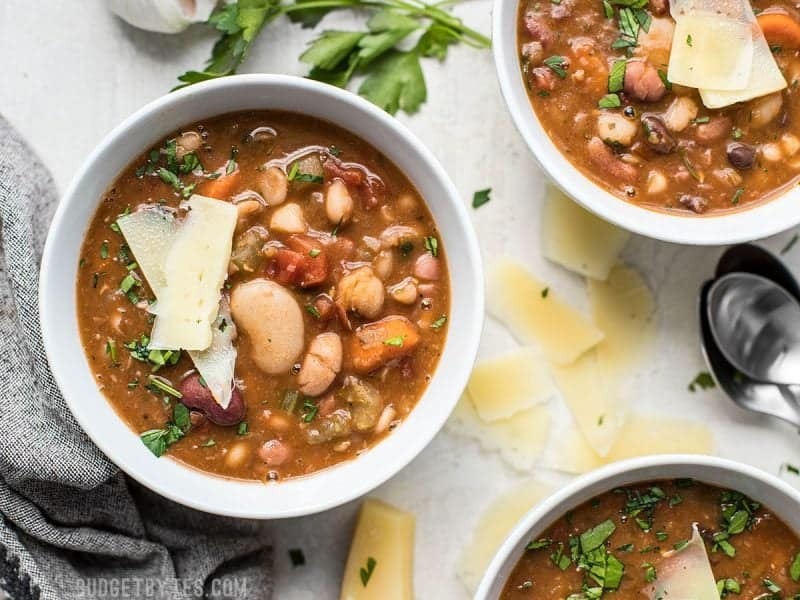 Beans are probably the most underrated super food. They’re packed full of fiber, protein, and antioxidants, while still being super inexpensive and shelf stable. And when you get 15 different varieties all in one pot, you’ve got a serious nutrition powerhouse! 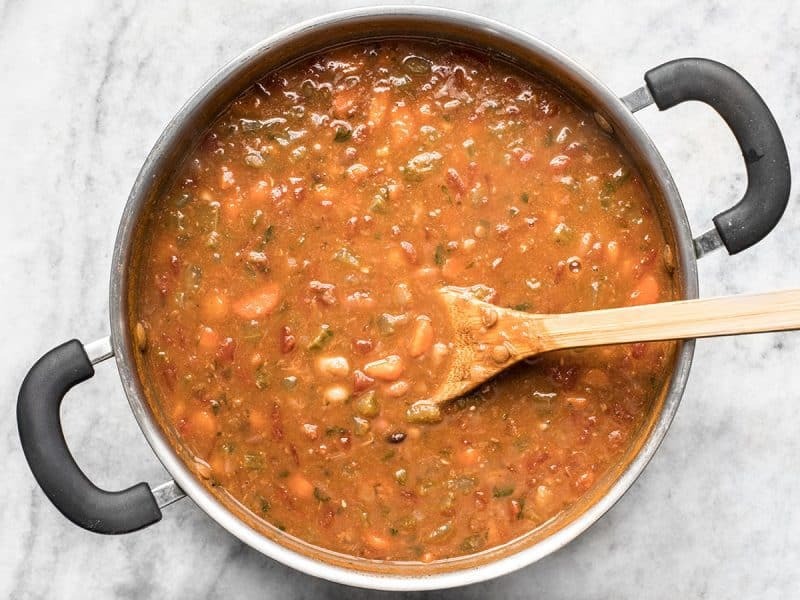 I decided to make it a Vegetarian 15 Bean Soup (it’s actually vegan) this week, but you could always add some bacon, a smoked ham hock, or smoked turkey leg to your soup for a little extra smoky flavor. What Kind of Beans Do I Use? “15 Bean Soup” mixes are fairly common in most major grocery stores, and they are sold right along side the other dry beans. They’re basically just a mix of 15 bean varieties in one bag, and they’re quite beautiful, with all their different colors, patterns, and sizes. They usually come with a seasoning packet, just like instant ramen, but I prefer to add my own herbs and spices. While this soup itself is vegan, I ended up topping it with some shaved parmesan. Other good toppings would be a dollop of sour cream, Greek yogurt (you could do coconut yogurt to keep it vegan), or even some shredded cheddar or Monterey Jack. And I definitely suggest serving with some crusty bread on the side (try this no-knead bread). 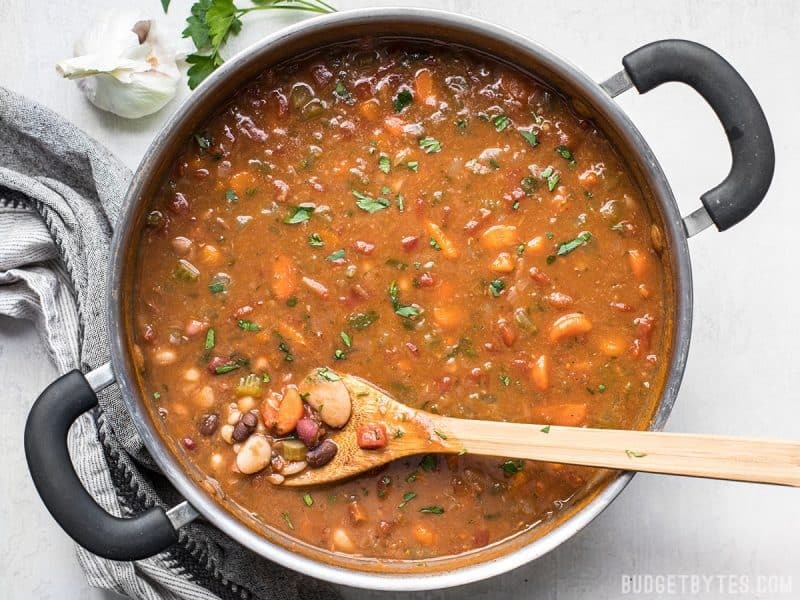 This Vegetarian 15 Bean Soup will freeze great, so don’t be afraid of the recipe’s large volume! Just divide it up after cooking, cool, then transfer to the freezer for long term storage. 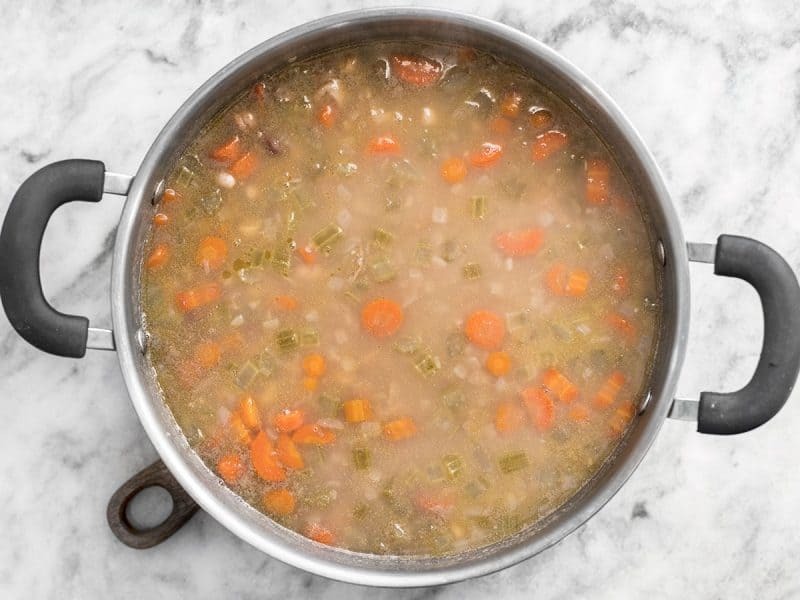 This soup does take some time to prepare, but most of it is passive time. So plan this recipe for a weekend or your day off so you can keep an eye on it while double tasking with something fun, like watching a movie. :) And don’t forget to start soaking the beans the night before! 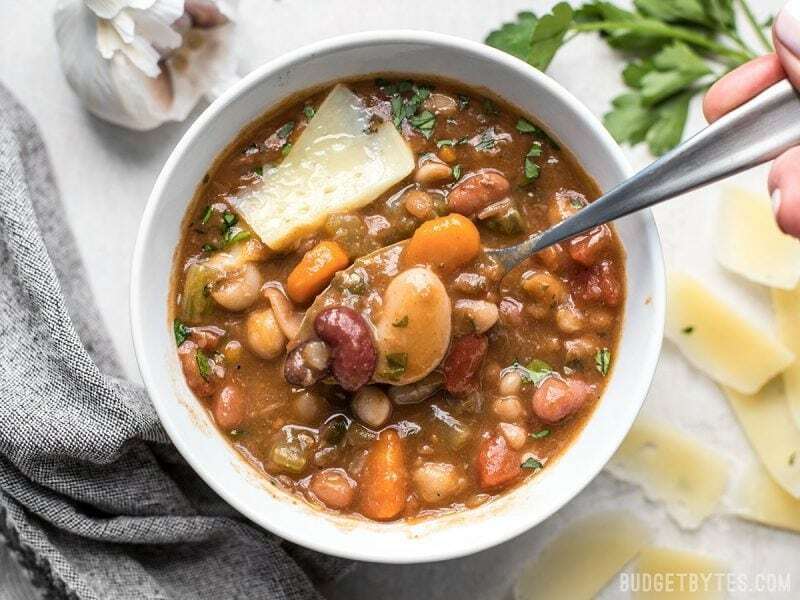 With a variety of colors, fresh vegetables, and vibrant herbs and spices make this Vegetarian 15 Bean Soup flavorful, filling, AND incredibly good for you. 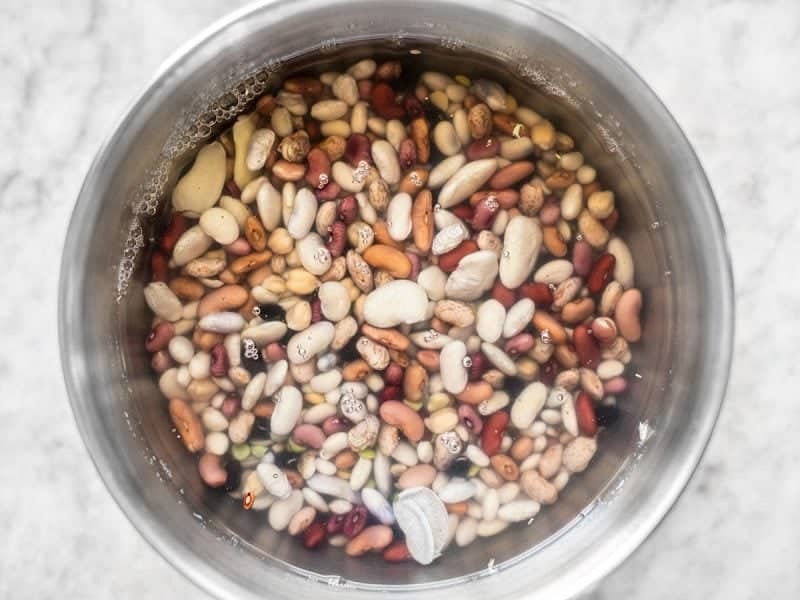 The night before, place the beans in a large bowl and add cool water until the beans are covered with twice as much water as the beans. 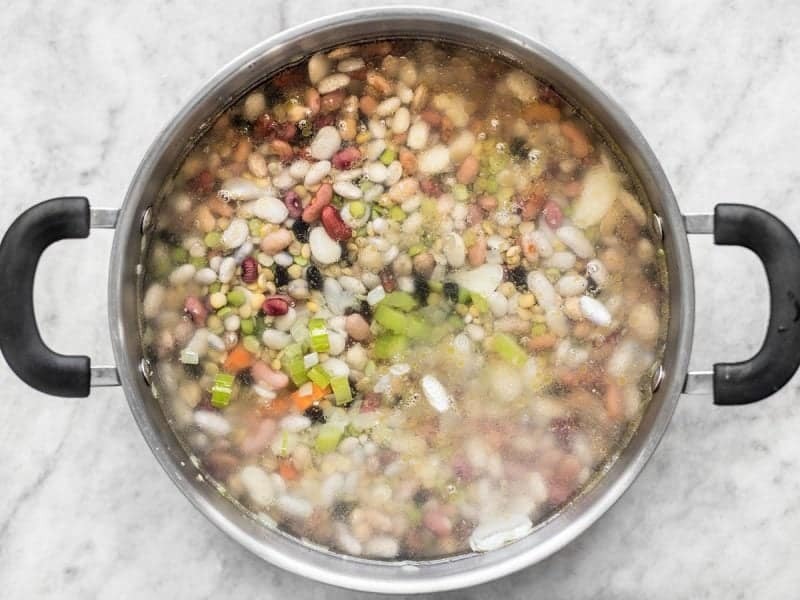 Let the beans soak overnight, or for at least 8 hours, in the refrigerator. 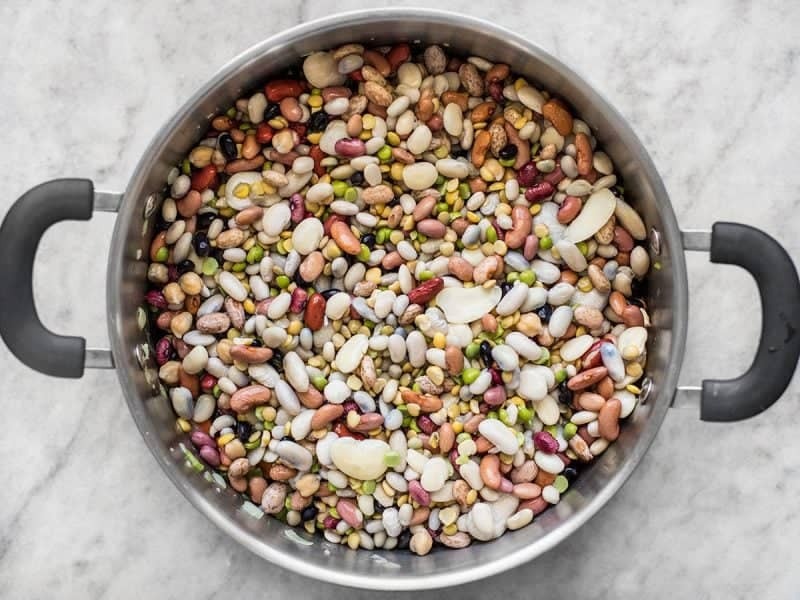 When you're ready to begin cooking, drain the beans in a colander and rinse them well with fresh water. Set the beans aside so they can begin to warm up. Mince the garlic and dice the onion. Add the garlic, onion, and coconut oil to a large soup pot. Sauté over medium heat for about 3-5 minutes, or until the onions are soft and transparent. While the onion and garlic are sautéing, dice the celery and carrot. 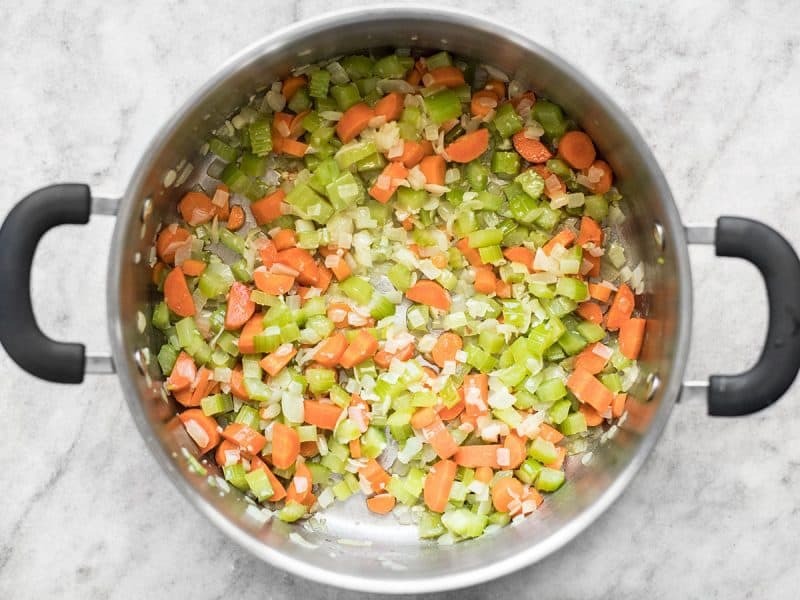 Once the onions have softened, add the carrot and celery to the pot and sauté for about 5 minutes more, or just until the celery starts to soften. Add the beans to the pot along with 6 cups of water, and stir to combine. Place a lid on the pot, turn the heat up to medium-high, and bring it up to a boil. Once it reaches a rolling boil, turn the heat down to low or medium-low, and let the beans simmer for 90 minutes, stirring occasionally. After 90 minutes, the beans should be quite soft and have broken down a bit, causing the water to look slightly thick and cloudy. Add the diced tomatoes (with juices), cumin, oregano, smoked paprika, cayenne pepper, and parsley to the pot. Stir to combine, then let the soup simmer for another 20 minutes. Taste the soup and add salt to taste (I added 1.5 tsp). Finally, stir in the apple cider vinegar. Keep in mind that as the soup is stored in the refrigerator, the salt may absorb into the beans and taste more muted. You may need to add more salt the next day. *This is just a mix of 15 bean varieties in one bag, with an envelope of seasoning included. I used only the beans and tossed the seasoning packet. **I used coconut oil because it has a mouthfeel similar to animal fat. You can use your favorite cooking oil in its place, if you prefer. The night before place 1 pound of the dry 15 bean mix (do not use the seasoning packet) in a large bowl. Cover it with enough water so there is double the amount of water as beans. Refrigerate the beans overnight, or for at least 8 hours. This is what they look like after soaking. When you’re ready to start cooking, drain the beans in a colander and rinse them well with fresh water. Dice one yellow onion and mince two cloves of garlic. 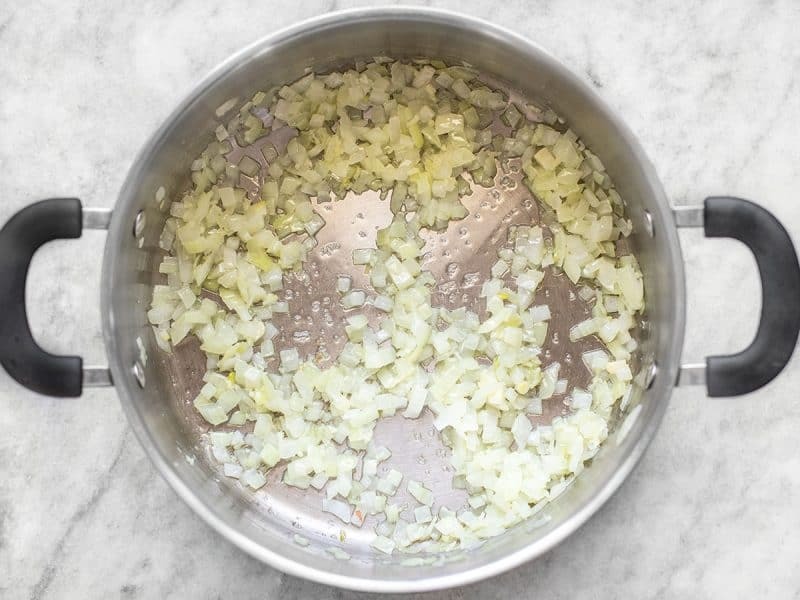 Add the onions, garlic, and 2 Tbsp coconut oil (or your favorite cooking oil) to a large pot. Sauté over medium heat until the onions are soft and translucent. While the onions and garlic are cooking, peel and dice 4 carrots, and dice 3 ribs of celery. Add them to the pot and continue to sauté just until the celery begins to soften (about 5 minutes more). And 6 cups of water. Place a lid on the pot, turn the heat up to medium-high, and let it come up to a boil. Once it reaches a boil, turn the heat down to low or medium low, and let it continue to simmer for 90 minutes. Stir it occasionally as it simmers. After it’s simmered for 90 minutes, the beans should be very soft and be breaking down. The broth will look all cloudy like this, and kind of pale in color. Now it’s time to add those top note flavors! Add one 15oz. can of diced tomatoes (with the juices), 1/2 Tbsp smoked paprika, 1 tsp oregano, 1 tsp cumin, 1/4 tsp cayenne pepper, some freshly cracked pepper, and a handful of chopped fresh parsley. Stir everything to combine, then let the soup simmer for another 20 minutes or so. And now it’s looking much more vibrant. BUT we haven’t added ANY salt yet, so the flavors are still quite muted. Now it’s time to season with salt to taste. I ended up using 1.5 tsp, but I suggest starting with 1/2 tsp, and increasing from there until the flavors really pop. 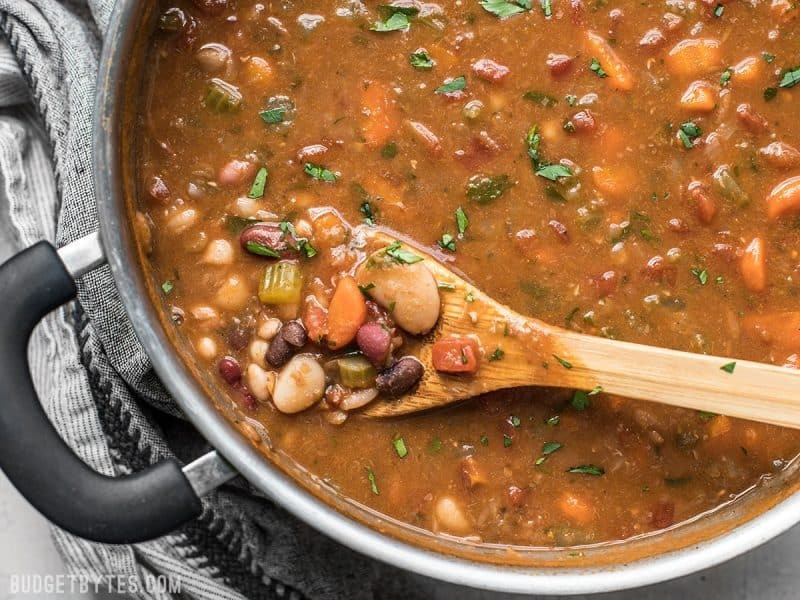 Keep in mind that as you refrigerate this, the salt will absorb into the beans some and become more muted, so you may need to add more the next day. Finally, stir in a couple teaspoons of apple cider vinegar to brighten it all up, and it’s done! 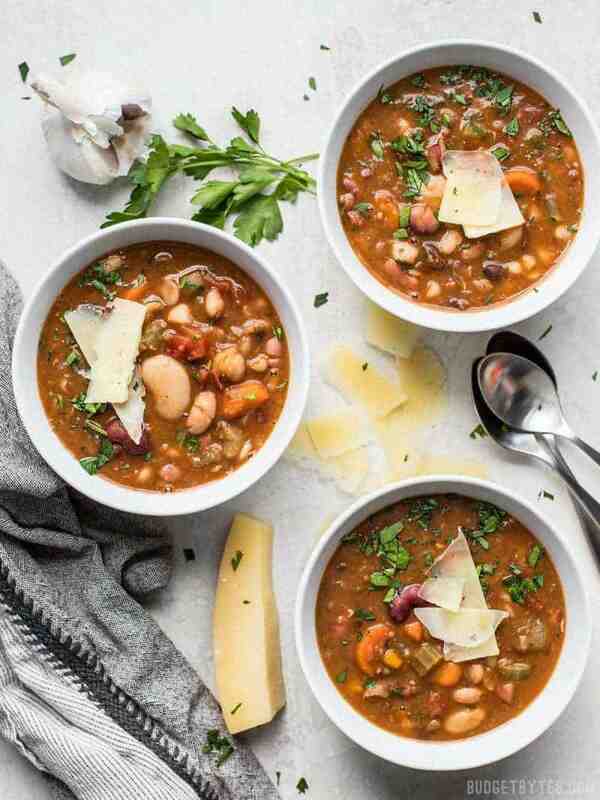 Hi, is it possible to make this soup using a variety of tinned organic no salt added beans? how will I alter the amount of liquids to the recipe? You would need to adjust the recipe quite a bit, both with the amount of liquid used and the cooking time. Unfortunately I would really need to do some testing to find the best method before offering any advice on how to do that. As someone who isn’t super versed in recipes and cooking, this was pretty easy to make! (As I have been finding with all the recipes I make from this site, really.) It made a lot and I was really happy about that because it was able to feed myself and my fiance for a week! I was really happy with how well it kept in the fridge, too. Thank you for sharing this recipe! This is delicious. Thank you for putting so much time into this recipe and this site. You really need to add a few more pop-ups and slide out videos & ads just to make it even more annoying. It’s a shame that you provide some good information and then ruin the experience with all the slide-outs! I won’t be back. That’s unfortunate because you’ll be missing out on some fabulous recipes. This is the first website that I go to when looking for something new and delicious. 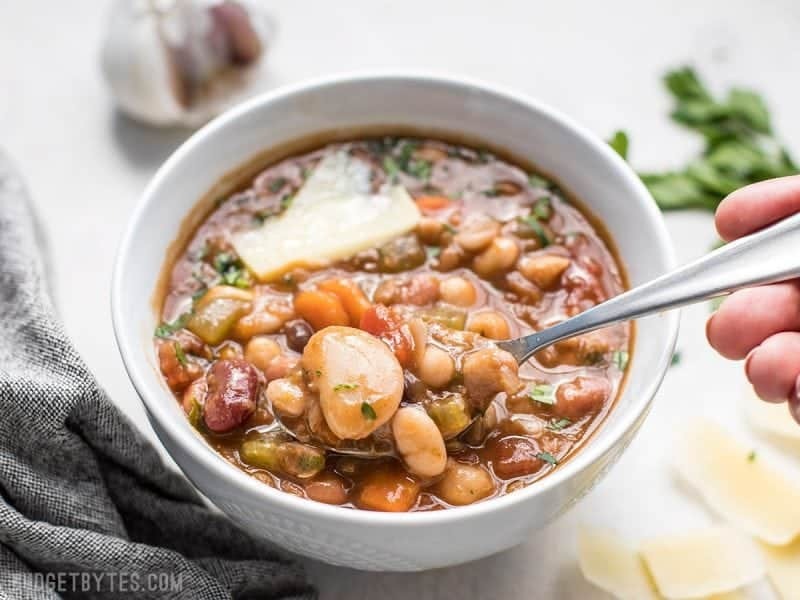 I always buy the Hurst’s HamBeens brand 15 bean soup and make it according to package directions in my slow cooker (directions for the slow cooker option are on their website). You don’t have to pre-soak for the slow cooker (winning). The seasoning packet is actually vegetarian, despite the name (http://hurstbeans.com/contact-us/faq/beans-seasoning). I really like the flavor; it’s like bbq baked beans. I often add greens at the end for some more veggies. You could use up whatever veggies you have in the fridge on this recipe too (carrots, celery, peppers, etc would all go well in my opinion). Just wanted to let your vegetarian and kosher readers know that they actually can eat HamBeens! I make a variation of this but your recipe sounds much better! Going to try your seasoning combo. With leftovers, I will put in 8×8 pan and make a box of cornbread mix to put on top. Sometimes I add shredded cheddar too. It’s so good. Kind of like tamale pie but more cornbread-y.